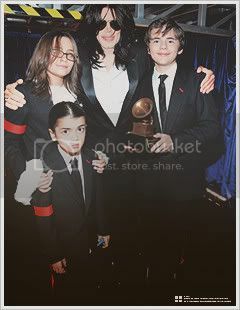 Ok i don't know what to think of this http://i904.photobucket.com/albums/ac24 ... grammy.jpg. some say it's photoshopped and stuff... but paris had it on her twitter account and a few hours later she DELETED IT. and something about those hands.... this pic just seems TOO REAL to be Photoshopped...lIMO :| :| . i know that he and Lionel wore the same suit but it could of been a illusion like beLIEVE. remember souza & mo said ''this is it should have been called This Is It-- Michael Jackson's Optical Illusion''. also i thought the head originated from o2 but the chin cleft is deeper in o2. *Edit* if this has been discussed already my apologies. yeah cuz those hands are kinda brown like Lional's hands. i seen the original already... but i still think the MJ one is real... im just following my gut :| and im not just saying this because im desperate to see MJ anywhere... it's just my gut telling this pic is real... anyone with me??? if you find the pics to mach then u can have mj in the pic with the kids. Your welcome! :D I really love the Michael's photographic archive, my PC is full of pics of him! :lol: And thank you for my avi's compliment. Fake...why did they such things? !